Revision is about going back to your writing to make it better. I was recently going through some old papers from my graduate school days and came across my notes from The Teachers College Reading and Writing Project specifically on revision. Below is a bulleted list of revision strategies compiled to help students dress up their writing to make it stronger and more clear. Add more – look at your writing piece and name two things you can do to make it better. Reread to see if it makes sense – is it clear? How can you make it sound better? What’s the most important thing you want to tell your read about your topic? Write the external and internal story (what you think, wonder, and feel). Talk to a friend or writing partner about your piece and then write. Think aloud. Storytell it and then write. Focus in on something small connected to your topic. Zoom in on a moment. Underline an important line and say more about it. Try starting your piece by writing the lead differently. Play with the form or genre – turn into a letter, a poem, a song. Find a book you really like and see if you can write like that. Model an author you admire. Take a sentence and turn it into a page (lift a line or word). Try starting the piece in a different place, chronologically. So, you taught a lesson, students completed many activities to apply this new knowledge – discussions, interactive notebooks, graphic organizers, collaborative assignments – and now they are ready for a quiz or assessment to show their level of understanding. Then, more than a dozen fail the quiz. What happened? Where was the disconnect? These students clearly need additional information, support, and possibly reteaching before moving on. Scaffolding does just happen during a lesson. It also need to happen after an assessment, especially for those who have yet to grasp the concept or standard being assessed. It is important to NOT just move on to the next unit of study when it is clear that some students need more practice and attention. Revision is key for my students who fail a quiz or short answer assessment. But I do not just allow students to go home, revise their work and then resubmit it for a better grade. Rather, I require these students stay after school with me working on the revision by completing a graphic organizer and questionnaire to help revise their work. Allowing for this revision work along with conferences with the teacher helps students to gain a better understanding of the topic. With the graphic organizer I chunk the concepts of craft, ethos, and pathos. 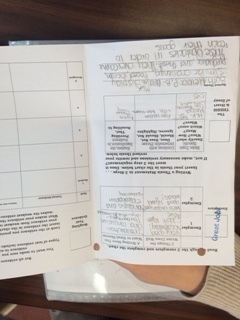 The graphic organizer includes definitions and examples so that students add text connections and details. Next, students show me their graphic organizers before moving to rewriting. This allows for an opportunity for both the teacher and the student to ask/answer questions to check for understanding. Scaffolding doesn’t just have to happen during a lesson. Our goal as teachers is to enhance learning and aid in the mastery of tasks. Visuals like Anchor Charts, Interactive Foldables, and Graphic Organizers allow students to visualize and organize their thinking. Models and Mentors can help students see what “Exceeds Standards” or “A” work looks like. I am always collecting student exemplars to read and discuss with my students what the writer did well and why it exceeds/meets the standards. Sentence Stems or Paragraph Frames can help students who need a task broken down into small parts. I always offer outlines for writing and graphic organizers to help my students break down the larger or longer projects and writing assignments. What are we asking students to do when we ask them to revise and reflect on their writing? I am of the philosophy that in order to become a better writer, one needs to write daily and look to examples of great writers as models and mentors. When it comes to writing essays in my English class, I have my students writing one essay each quarter. It is not enough if you ask me, but in this current climate of high stakes tests I continue to find a balance between teaching reading and writing. I have my students write their essays in class and after I read through them, I allow students to revise and improve their essay for a better grade. After reading through the recent compare and contrast essays students wrote in response to Melba Patillo Beal’s memoir, Warriors Don’t Cry, and Martin Luther King Jr’s “Letter From Birmingham Jail,” I planned a revision workshop to help students reflect on their writing and pinpoint areas where I found many students needed additional support. Reading through ninety five essays I found three places to “teach back” and help improve student writing: Writing a solid thesis or claim; Choosing the strongest evidence to support one’s claim; and Using better transition words. I created a Revision Passport to guide students throughout the revision workshop and allow students to move around the classroom visiting different stations to help revise and reflect on their writing with the objective to nudge students to revise their writing and produce a stronger essay. After completing the work at a station I checked their work and gave them a stamp on the passport. Students had to complete four different stations. I pulled out two student essays that I felt were exemplars for the entire grade. I retyped the essays and removed the student’s names from the essay for the rest of the class to read through. 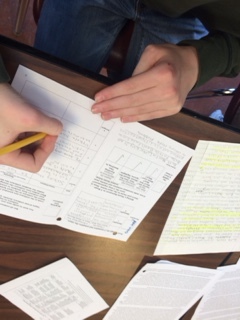 Students had to write down two things the writer did well in the essay and then record a “writing move” they wanted to steal or borrow from the exemplar. Although I have created interactive foldables and taught lessons on writing a clear and solid thesis, this is still a struggle for many writers. The thesis or claim is the heart of the essay. English teacher Ray Salazar has a great blog post on writing a thesis in three steps which showed my students. I made a graphic organizer for students plug their thesis into the 3 steps Ray describes and then figure out what is missing or what needs to be added to help write a revised thesis that is specific, debatable, and significant to the essay prompt. Not all evidence weighs the same. Students need help finding the strongest evidence to support their claim. At this station I had students look at the evidence they provided in their essay and rank the evidence from strongest to weakest on a graphic organizer. In addition, students had to explain why the evidence is weak or strong. What makes the strongest evidence and why? Looking back at their essay and the work they did during the revision workshop students completed two reflection tasks. Students had to rewrite, in their own words, the comments I made throughout their essays and what I wanted them to improve on. Then, students were to give an example how they were going to make their writing better based on teacher’s comments and the work they did in the revision workshop. Below is a copy of the revision passport I created and used with my students.